I had a very full but wonderful weekend! When it looks like there may be little time to breathe between the coming and going, my desire to draw kicks in full throttle. Maybe it’s something to do with a need to slow down somewhere in the midst of it, or to have a touchstone to my life as I’m experiencing it fly by me. I dunno. But I do know that I have to travel lite and so I put my trusty square Aquabee sketchbook in a ziploc bag with two Sharpies, one big, one little. The awesome thing about drawing with a fat Sharpie is that it forces you to be quick about it and to just get down the major parts…no fiddling about with details. If there’s time, you can use the thinner Sharpie for a few details, and then sometime later, go back in with watercolor. A lovely combination I think. My weekend started off with drawing downtown at our Ciener Botanical Gardens with a few other artist friends. I do not have this one to show you yet…I tackled a very long accordian drawing and I CAN’T WAIT to show it to you when I’m finished!! After that, I took my two younger kids and a friend to the Dixie Classic Fair!! Friday evening was beautiful and warm. The above drawing was done in YesterDay Village, my absolute favorite part of the Fair! 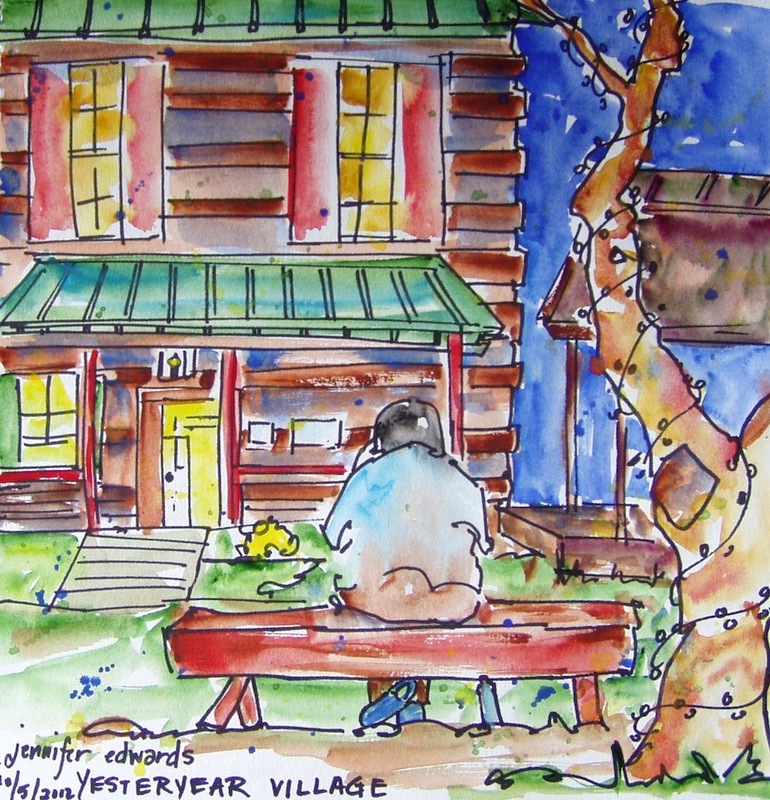 Trees wrapped in Christmas lights, old cabins and tobacco barns, tractors, pottery and basket weaving, and the awesome chain saw sculptor, Jerry Ward. Maddie and I hung out here for quite a while, munching on Kettle Corn as the evening fell into indigo. It was lovely. Then right before we left for home, I heard strains of beautiful music coming from the vicinity of the Clock Tower. I asked William about it and he said that he and his friend had already listened to this guy twice that afternoon and loved his music. As I got closer I realized I had heard this musician before. 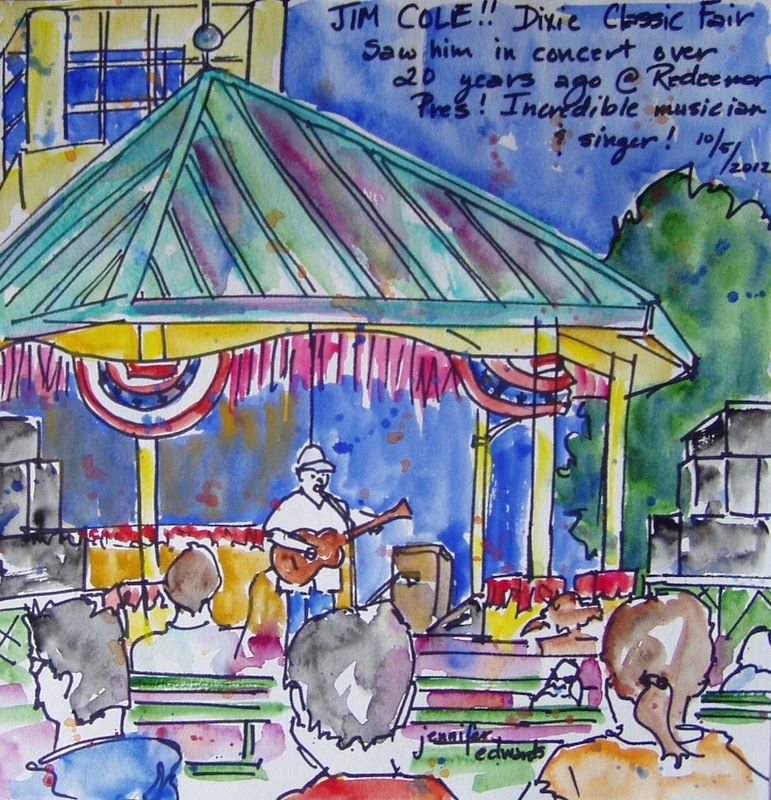 It was Jim Cole, who back in the early 90’s had performed several times in Winston at our church. It was awesome to hear him again…exquisite guitar melodies with a fantastic voice that has hints of James Taylor, a fact that Jim jokes about since he hears it so much. It was the perfect way to end the night. Well, except for the fireworks that began as we walked away from the Clock Tower. Ooohs, aaahs, and sighs from a lovely evening. On Saturday we traveled to Wingate University to spend the day with our college girl!!! It was fabulous catching up with her, going on a tour of the campus and seeing the places she hangs out the most, which is the Batte Center since she is a music ed. major. We tailgated with BBQ and all the trimmings and then went in to watch Wingate play football against Mars Hill. We only lasted to the end of the 1st quarter. I sit here blogging and it’s 44 degrees outside. But that day (just 4 days ago), it was 84 degrees, and in the blistering, autumn sun, neither Maddie nor I could take it anymore. We got our folding chairs and set up in a strip of shade provided by the concession stand at the top of the Erwin Belk Stadium. I only got on paper the two people leaning and sitting, before a friend walked by and we chatted and caught up with each other. The rest of the family was done with the heat by this time and wanted to go for ice cream, so I had to finish this from memory when we got home. It wasn’t too hard to leave Catherine there again, knowing she will be home this Friday for fall break! We got in the car AGAIN on Sunday afternoon!!! We are crazy, yes? We drove to Lincolnton, NC where Randy’s parents live in order to celebrate his dad’s birthday. I do wish I had a drawing of this day. But I was having too much fun gabbing and hanging out with the family to sit down long enough to draw. Those memories will have to stay logged in my heart and mind. That’s always the tension: do I draw it? and thereby live it? Or do I just live it? If you draw everything, you won’t experience some of it. But if you don’t draw any of it, you’ll miss something. So even a drawing from memory or from a photo is better than none at all. 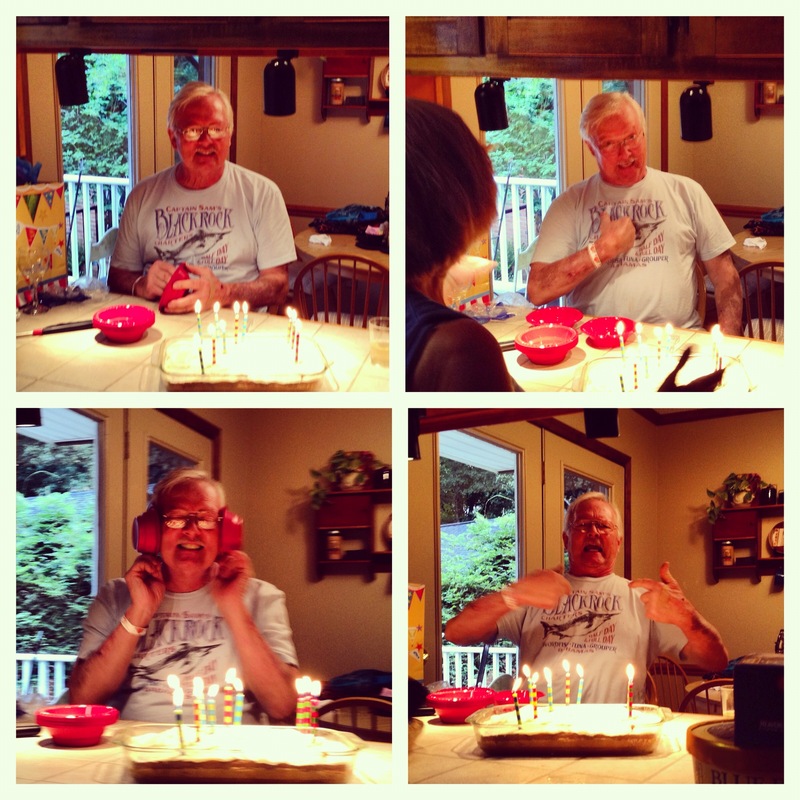 Hmmm…so where are those goofy photos of Grandpa right before he blew out the candles on his cake……?? I gotta draw THAT! Oh please do! Grandpa would make a great subject! 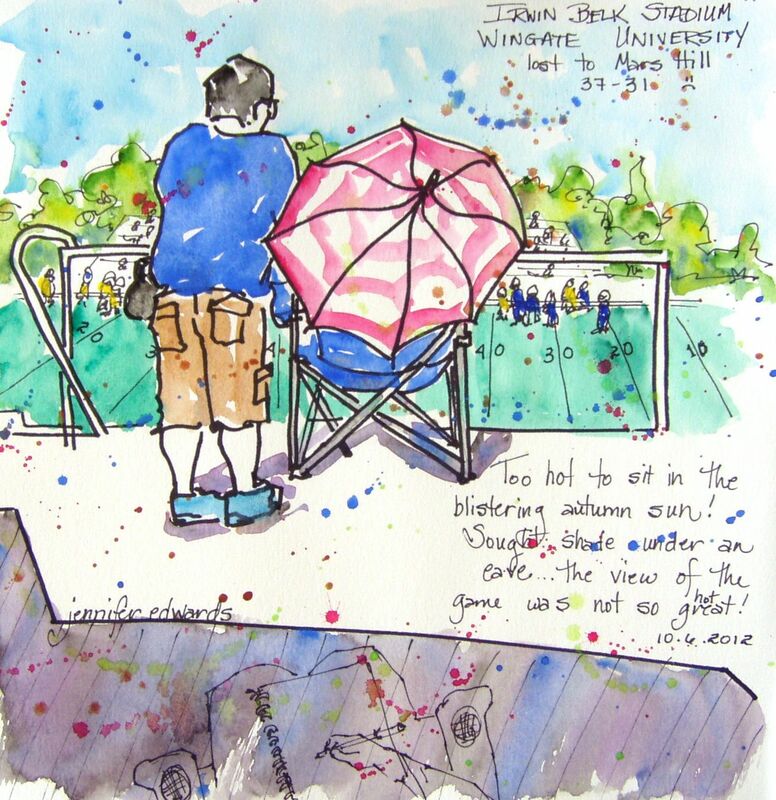 I needed this – I love the square Aquabee sketchbook too and I need to travel way way way more lightly. I want to take EVERYTHING and then I find myself not wanting to deal with all the supplies. I love the idea of the two sharpie’s. Are they regular Sharpie markers or something different; and do they bleed through the other side of the sketchbook page? Hi Deborah! They are just regular Sharpies. And in the Aquabee Sketchbook, they did NOT bleed through. The lines can be seen through the other side but it hasn’t bled through…does that make any sense? Hi Jennifer, What a wonderful record of your weekend, hectic too. I can’t wait to see your accordian drawing. I agree with Tracy, when you have the time Please do Grandpa. “Drawcumentation” is an awesome word and so very descriptive. Your drawings always fascinating me. Your use of colors, your line, your freshness. And also your way to comunicate and document… great! Thank you Stefano. What a kind and lovely compliment!